From time to time, the Palestine Center distributes articles it believes will enhance understanding of the Palestinian political reality. The following article by Amira Hass was published by Haaretz on 13 August 2012. The Welcome to Palestine initiative is planning a challenge for the Israeli authorities at the end of August, when 100 left-wing and human rights activists from Europe and the United States will attempt to enter the West Bank and spend several days in Bethlehem. On August 26, the group plans to enter from Jordan through the Allenby Bridge crossing and go directly to Bethlehem, whose governor, Abdul Fattah Hamayel, has issued them an official invitation. They will carry school supplies to distribute to local children as presents, and plan to remain in the West Bank until August 31. This is not the first time the group has provoked Israeli authorities. In April, Welcome to Palestine arranged a “fly-in” protest, in which hundreds of activists landed in Ben Gurion Airport, with the intention of entering the West Bank. The event resulted in some of the activists being detained and sent back to Europe. In a press statement issued by the group on Monday morning announcing its intentions, Welcome to Palestine recalled the four foreign ministers of non-aligned nations whom Israel blocked last week from participating in a Ramallah conference in support of Palestinian statehood. The four ministers, from countries with which Israel has no diplomatic relations, had also tried to cross from Jordan, but were denied entry. The statement included a letter from Bethlehem governor Hamayel to French Foreign Minister Laurent Fabius, congratulating him on the victory of the Socialist Party in France’s recent elections, and expressed hope that it heralds a change in attitude toward Israel. Hamayel asked Fabius to support the international activists, among them French citizens, and to make sure that Israel does not “humiliate” them, as he put it, as it has done in the past. “It will be chaos for a while,” said Moataz, an activist from Damascus. But discussions and planning about the postwar period are a major concern for opponents of the Syrian regime, the activists said in a lengthy group interview in Beirut. The activists spoke on condition of anonymity because they were returning to Syria to continue their rebellion. Dozens of them had been invited abroad to take part in a training programme organised by Avaaz, a western group. No other American presidential candidate has ever left the US to garner campaign contributions from foreign citizens. There is a reason for this, one Romney and his staff seem oblivious to and the mainstream media has ignored. Using foreign contributions in any American election is a felony. If you go outside the US, if you stay inside the US, if your contributor is living in the US but not a citizen, any money you get can mean years in jail. For Romney, he went the whole way, outside the US, foreign citizens, and while traveling humiliated himself and his country with his ignorance and his attempts to trade illegal cash for promises of illegal war. One could hardly break more laws if one wanted. A real question many might ask, why would a presidential candidate travel outside the US to seek campaign money at all? As the Supreme Court points out, in the decision Bluman, et al., v. Federal Elections Commission, no foreign cash, especially collected overseas, can ever be used in an American campaign. In a terse four words, the Supreme Court on Monday issued an order upholding prohibitions against foreigners making contributions to influence American elections. The decision clamped shut an opening that some thought the court had created two years ago in its Citizens United decision, when it relaxed campaign-finance limits on corporations and labor unions. On Monday the Supreme Court, upholding a lower court’s decision in Bluman, et al., v. Federal Election Commission, refused to extend its reasoning in Citizens United to cover foreigners living temporarily here. Foreign nationals, other than lawful permanent residents, are completely banned from donating to candidates or parties, or making independent expenditures in federal, state or local elections. The Supreme Court’s order did not discuss the merits or suggest that there was any dissent among the justices. The problem stems with bad legal advice Romney received from his campaign finance staff. The Romney campaign had been laundering money through corporations, money moved into the US under the “Citizen’s United” decision of the US Supreme Court. Romney figured he could then go anywhere in the world, peddle foreign policy, promise war, play president and collect cash from foreigners though this is specifically prohibited by US law. In doing so, he is no longer qualified for office and, if challenged by Ron Paul, has no standing at the Republican Convention. With such a clear violation of law, not just blatant but massive, Romney could face years in prison. The Romney/Bain legal team was not available for comment. It is now for Romney to prove that not one cent of contributions collected from thousands in Israel was actually collected from Israel. We wish him good luck with that. Egyptian President Mohammed Mursi has said his move to order the retirement of two of the country’s top generals was for “the benefit of this nation”. He was speaking after replacing the powerful head of the armed forces, Field Marshal Mohamad Hussein Tantawi, and Chief of staff Sami Annan. Mr Mursi also said a constitutional declaration aimed at curbing presidential powers had been cancelled. Mr Mursi, who was elected in June, is linked to the Muslim Brotherhood. Relations between Islamists and the military have been increasingly tense since the fall of President Hosni Mubarak last year amid mass street protests. “The decisions I took today were not meant ever to target certain persons, nor did I intend to embarrass institutions, nor was my aim to narrow freedoms,” Mr Mursi said during a speech to mark the Muslim fasting month of Ramadan. As he took office it seemed President Mohammed Mursi would be governing within narrow limits set by Egypt’s generals – who had exercised power behind the throne for decades and then exercised it directly in the months since the fall of Hosni Mubarak. But it is possible Mr Mursi’s opponents may have underestimated him. Egypt’s army was unprepared for a recent attack on a security base in the Sinai desert by Islamic militants in which 16 soldiers died. Mr Mursi appears to be seizing on that failure – which shocked ordinary Egyptians – to move against two key members of the high command. It may be that the move has been co-ordinated secretly with other influential generals behind the scenes but for now, no-one can be sure. “I did not mean to send a negative message about anyone, but my aim was the benefit of this nation and its people,” he said. The president also praised the armed forces, saying they would now focus “on the holy mission of protecting the nation”. It was announced earlier that a career army officer, Gen Abdel-Fattah al-Sisi, would replace Field Marshal Tantawi as both armed forces chief and defence minister. Field Marshal Tantawi, 76, has not yet indicated whether he accepts the moves. However Gen Mohamed el-Assar, a member of the Supreme Council of the Armed Forces (Scaf), told Reuters news agency the decision had been “based on consultation with the field marshal, and the rest of the military council”. A presidential spokesman said Gen Annan and Field Marshal Tantawi had been appointed as presidential advisers and were given Egypt’s highest state honour, the Grand Collar of the Nile. BBC Middle East correspondent Kevin Connolly says the dismissal of senior military officers will be seen by Egyptians as a decisive move in a struggle for real power between the country’s newly elected politicians and the generals who have exercised power for many years. As head of Scaf, Field Marshal Tantawi became Egypt’s interim ruler after President Mubarak was ousted following last year’s mass protests. 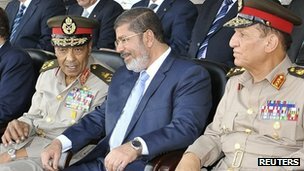 Under the interim constitutional declaration issued by Scaf before Mr Mursi was sworn in, the president could not rule on matters related to the military – including appointing its leaders. The council also dissolved parliament, which is dominated by the Muslim Brotherhood. Tensions between the presidency and Scaf were further exacerbated after Islamist militants in the Sinai peninsula killed 16 border guards last week, in a raid that embarrassed the military. The president, whose own Brotherhood movement renounced violence long ago, sacked Egypt’s intelligence chief and two senior generals following the attack. Mr Mursi resigned from his positions within the Brotherhood, including his role as chairman of its Freedom and Justice Party (FJP), when he won the presidential election in June.